A desperate last glance from a pair of black eyes has been engraved in the memory of millions in Turkey and around the world as the ultimate outcome of violence against a puppy, overshadowing the joy of Ramadan Bayram for many, and hopefully becoming the final straw in introducing a long-sought animal rights reform. The death of a puppy after being found in a heavily injured condition with its four feet and tail cut off in northwestern Turkey has stirred public outrage and quickly rose to newspaper headlines and became the top report in news bulletins. The one-month old puppy was found Thursday, on the eve of Eid ai-Fitr marking the end of the Islamic holy month of Ramadan, by locals in a forested area in the Yüzevler neighborhood of Sapanca district located in the northwestern Sakarya province. The puppy was first rushed to a veterinary in Sapanca town center late Thursday. The puppy was transferred to an animal hospital in Istanbul's Ataşehir district after first aid treatment. As media outlets started covering the brutal torture of the puppy, the incident quickly went viral on social media with people demanding the perpetrators to be found. The puppy initially responded to treatment and promised hope for full recovery with footage showing which showed it eating and drinking in the hospital. Sympathy messages poured out in social media with numerous people offering to cover the costs of prosthetic limbs to be fitted to the puppy. The hospital announced later Friday that the puppy could not survive a surgical operation. Veterinary Berktuğ Çiftçi, who assumed the treatment of the puppy in the hospital, previously told Doğan News Agency that the puppy was in a critical condition and that there is a treatment period of 15 days. Çiftçi added that the scars show straight cuts made with a sharp object such as an axe, which left no doubt that the harm was inflicted by a person. 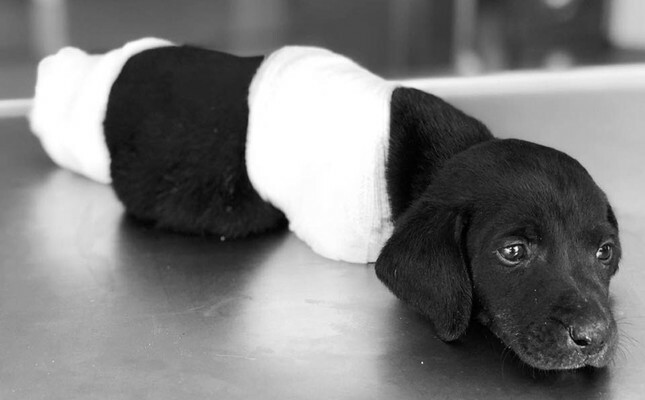 Onur Çakmak, the veterinary who applied the first aid to the puppy in Sapanca, also stated that the puppy's feet and tail were cut off with a sharp object. Nuray Ersoy, the woman who found the puppy in an injured state while feeding the stray animals in the wooded area, said an initial investigation of local gendarmerie units show that the puppy's feet might have been cut with heavy construction equipment in the area. Sakarya Governor İrfan Balkanlıoğlu also said late Friday that initial findings suggest that the the puppy's feet might have been ripped off during a road construction with heavy construction equipment in the area. Balkanlıoğlu said they have launched a wide-scale investigation into the incident and will take all necessary judicial and administrative measures against the perpetrators. The Public Prosecutor's Office in Sapanca also announced Saturday that an investigation was launched into the incident, an an earth mover operator from the Sapanca Municipality was detained later in the day. Sakarya province police chief and gendarmerie commander also arrived in the scene to oversee the investigation by security forces and municipal workers to find the dead puppy's feet and other evidence related to the incident. The earth mover that was working in the area was also brought to the scene, where the mother dog and other puppies were lying inside grass despite all the crowd and the noise. Sapanca District Governor Ali Ada said that Sapanca is indeed an animal friendly district an many summerhouse owners in the area known for its distinct nature leave their dogs behind, increasing stray animal population. Ada asked vacationers to leave such dogs to the municipal animal shelters and warned locals not to feed stray animals on roadsides. Mayor Ali Yılmazer also described the incident as a work accident and expressed his sorrow that the district and its population is associated with such serious accusations. Erol Yıldız, a local that had requested the earth mover from the municipality for road construction, said that he previously announced on his social media account that this is a work accident and criticized animal rights activists for accusing Sapanca with animal cruelty. "This is a work accident and the real murderers are those who leave these dogs here," he told Anadolu Agency. This illustration was widely circulated in social media after the puppy's death. Presidential Spokesperson Ibrahim Kalın said Saturday that he contacted Balkanlıoğlu over the incident. In a message posted with "#HayvanaSiddetSuctur (Violence Against Animals Is A Crime) hashtag on his official Twitter account, Kalın said they will not back down on the judicial and social fight against animal cruelty. The hashtag was among global top trending hashtag on Saturday. President Recep Tayyip Erdoğan tweeted Saturday afternoon that he gave instructions to clarify the incident. "Protecting animals is not only a duty but also a requirement of our faith, humanity. Animals are not property, they are lives, they are entrusted to us by God," Erdoğan wrote. He reminded that the ruling Justice and Development Party (AK Party) introduced the No. 5199 Animal Protection Law in 2004 and amendments in a proposed government bill concerning increased legal sanctions will be a priority in the new legislative year. Nationalist Movement Party (MHP) Chairman Devlet Bahçeli said on his Twitter account that the image of the puppy does not leave his memory. "There is not a word to say to those murderers who are the symbol of humanity's shame, nor an excuse to cover their terrifying act. The puppy that was subjected to torture and torment has died, burying everyone who say I'm a human being with it," Bahçeli said, adding that there is no difference between torturing a puppy and killing a baby in terms of meaning and content. "I must emphasize that we will make every struggle to bring crimes against animals under the scope of penal code. We will certainly provide the improvements needed in the No. 5199 Animal Protection Law," he said. The incident was also brought up by main opposition Republican People's Party (CHP) Vice Chairman Haluk Koç before a delegation from the AK Party visiting CHP headquarters on the grounds of Ramadan Bayram. Koç asked the perpetrators to be found and punished, urging a common stance against all types of violence. Presidential candidates Muharrem Ince of the CHP and Meral Akşener of the Good Party (IYI Party – IP) also condemned the incident on Twitter. Often described as a haven for stray animals, especially for cats roaming free in its cities, Turkey occasionally faces incidents of violence, cruelty and abuse against animals. A number of videos and images showing individuals beating, torturing stray dogs and cats, emerged in the last couple of years, has triggered widespread public outcry. Animal activists have long campaigned for violence against animals to be defined as a crime instead of misconduct, in addition to aggravated penalties. Existing laws only impose fines for crimes against animals. Despite a consensus on the issue, a draft bill foreseeing prison terms for crimes against animals proposed to the cabinet by relevant ministries in April is still pending in the parliament. On Saturday, almost all politicians commenting on the incident, including Deputy Prime Minister and Government Spokesperson Bekir Bozdağ, Justice Minister Abdulhamit Gül and Energy Minister Berat Albayrak, pledged that the introduction of the bill will be a prioritized subject in the new legislative year after the June 24 elections.